Boat Description This elegant blue-water yacht follows in the tradition of the sailing boats on which Jeanneau has built its reputation - with a layout designed by architect Philippe Briand.  FOR THE OWNER: The magnificent Sun Odyssey 49 is one of the most seductive yachts around, with a classic teak-clad interior. Available in a 3-cabin/2-heads version. 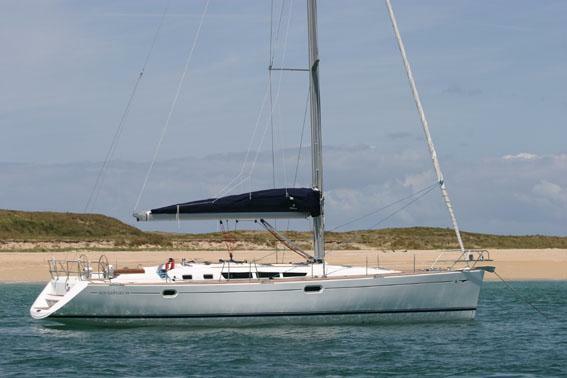  FOR CHARTERING: Offers the best value on the market with 4 modular cabins and 4 heads. Cockpit Wide cockpit, teak batten seats and floor, two side lockers Central pedestal for cockpit table, aft cabin air vent and lighting Gas locker for two bottles Two wide lockers under helm seats, with access to steering system Wet locker with teak grating between helm positions 2 steering wheels, leather wheel covers, compass mounted on white lacquered aluminium column Vertical engine control lever in starboard helm station Cockpit table with folding sides, central storage and glass holders Handrail with lighting on cockpit table Room for electronics on each helm station and under cockpit table Access to transom skirt via 2 GRP doors Teak batten stern platform steps and bottom, cockpit shower Sliding swim ladder with teak steps Steering: Twin steering wheels, self-aligning rudder bearings Stainless steel cable steering , molded aluminium quadrant Fiberglass rudder with stainless steel frame and shaft Rudder tube fiberglassed to hull. Electrical 12V Alternator connected to main engine (60 or 80A depending on selected version) Load distributor single input  two outputs One 110Ah engine starter battery One 12V battery park of 110Ah comprising 3 batteries (+1 optional) for domestic use One 220V shore power line with differential circuit breaker (12V/60A charger optional) One positive battery isolator for engine, one for domestic circuit, one general negative circuit breaker 12V electric panel at chart table with automatic circuit breakers 12V charging ammeter, 12V voltmeter, consumption ammeter 220V electric panel with automatic circuit breakers, 220V voltmeter 220V power source collector : shore, generator (optional) Electrical and accessory options : Generator set ONAN 4 kW  2400 rpm 220V 12V electric coachroof winch 12V electric genoa winches Water maker DUO 12V/220V - 60L/H 220V air conditioning unit 220 V dish-washer under the galley worktop Stainless steel 220V 24L microwave oven Additional 12V freezer unit cooled by hullmounted external plate Fuel powered pulsed air heating comprising of two generators with: one outlet in each cabin, two outlets in the saloon area, one outlet in each head compartment.